Dashboards highlight important information, allowing you to easily drill down to take action. This dashboard gives payroll managers a holistic view of payroll, scheduling, and human resources information in a single screen. Each statistic is linked to more detail. 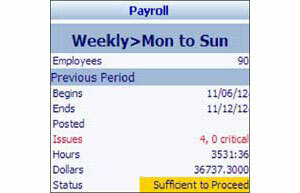 Critical issues, which need correction before payroll is exported, are highlighted. Red warns of errors that must be fixed; yellow indicates that investigation may needed; green means payroll is ready to go. The payroll export is initiated in one click. Critical issues are highlighted in red. Items in yellow may need investigation. 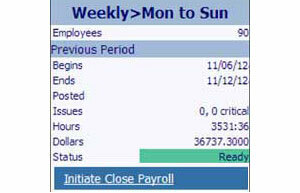 Green means payroll is ready to go. 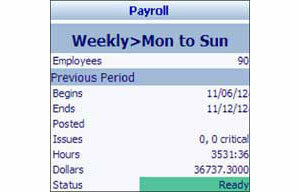 Payroll export is initiated with one click. 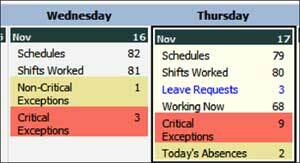 The Calendar Dashboard provides supervisors a snapshot of the most important attendance management issues in their area. 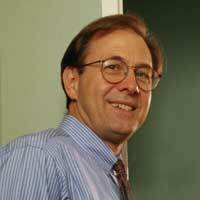 Check the number of schedules to see if it is adequate for labor coverage. Call in replacements for absent employees. Clear any critical exceptions from the previous day.